It is located on the coastal peninsula of Halkidiki marking its historic establishment in 1052. During the four-hundred years of Ottoman occupation, many of the monasteries were seized and destroyed as also many monks and Christians who became victims of the barbaric means of execution. Many were beheaded due to their faith and who were impertinent to not betraying their faith and Christians who were protected in underground shelters in the monasteries. During the Ottoman occupation, reinforcement of injustice towards Orthodox Christian faith was very dominantly executed thus prohibiting children from attending education in schools. 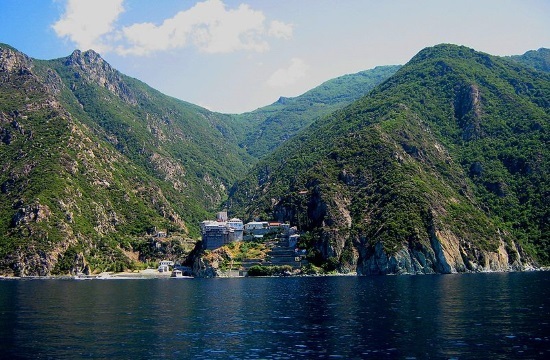 In order to save and support the young generation, the monks had invented and built secret passages within the monasteries which would help secure them but also tutoring them with ecclesiastical hymns, liturgies and the Greek language. These were the ‘Secret Schools’ which children attended in order to avoid becoming enslaved or becoming janissaries. The stunning orchard of the Virgin Mary, solemnly protrudes amongst all the monasteries which surround it and it is the Mother of Christ who is the only representative of the female gender to enter due to purity. The British monarchs, Prince Phillip and Prince Charles have often till today visited Agion Oros and in fact have become Orthodox due to the fact that Prince Phillip is of Hellenic origin. On no account, had Prince Phillip or Prince Charles complained about the denial or restriction of their Majesties’ wives not being permitted to visit the Holy Agion Oros monasteries. Consequently, there are restrictions which must be abided by as to maintain the sole traditions consigned for centuries. For many centuries and through endangered epoch, the historic emblem of the monasteries has achieved the difficult goal of stabilising Christianity from the intervention of alienated resources and have retained their divine knowledge through different manuscripts. The monasteries have developed many interesting features through which nature has invested such a plethora of herbs. They cultivate herbs, recognise botany and produce many therapeutic organic creams and health products which are remarkably beneficial for many allergies and ailments. Another interesting fact, which most may not recognise is the fact that the monks have kept ancient Byzantine recipes which have been recently acknowledged and admired from other Mediterranean countries as being amongst the healthiest, utilizing dietary ingredients to establish healthy hearts and metabolisms.